With its calm turquoise waters and a host of islands, each with its own identity and idiosyncrasies, Croatia is one of the coming and still undiscovered Europe’s triathlon destinations. The inaugural Triathlon Long Island will take place on September 23, 2018 in Dugi Otok island (Croatian for "Long Island", Italian: Isola Lunga), in the Adriatic Sea in the beautiful Croatia (located off the Dalmatian coast, west of the Zadar city – voted as the best European Destination city), known far and wide for its pristine natural environment which remains a pleasantly low-profile destination, despite Croatia’s current popularity. An island of peculiar contrasts and the largest island of the North Dalmatian island group has a lost-in-time feel, with plenty of relatively untouched natural beauty to enjoy. The name means ‘long island’: stretching from northwest to southeast it's 43km long and just 4km wide. The southeastern coast is marked by steep hills and cliffs, while the northern half is cultivated with vineyards, orchards and sheep pastures. In between is a series of karstic hills rising to 338m at Vela Straža, the island’s highest point. This island is well-known as one of Croatia's best-kept secrets – place of true peace and tranquility. 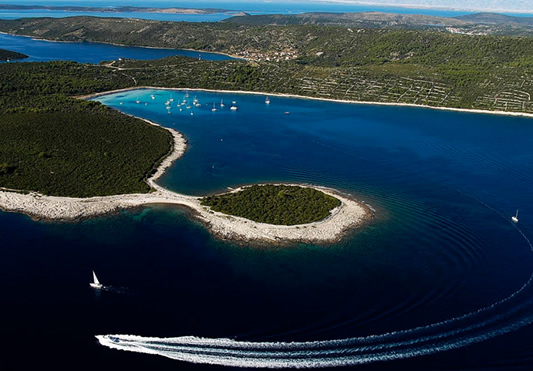 Named for its characteristic shape, Dugi otok (Long Island) is 45 kilometers long and just 5 kilometers wide. An island of hidden coves, sheer cliffs, ancient ruins and gorgeous white pebble beaches is the perfect destination for travelers seeking unfogettable scenery and historical sites. This is what Dugi otok makes ideal place for multisport event - middle distance triathlon. Swim course of the Triathlon Long Island starts at Sakarun bay – one of Croatia’s most loveliest but least-known spots – known as true paradise beach and is made of 1 lap - 1900 m swimming in counterclockwise direction. A sandy bottom and shallow waters make this calm cove very popular. The intensity of the colours - the dark green pinewoods, the shimmering white pebbles, and the sea that changes hue during the day, depending on the position of the sun - it makes the Sakarun beach so special. Athletes then head south on 90 km long bike with 1266 m elevation ride towards National Park Telašćica in the southeastern part of island, while never losing sight of the deep blue seascape of the Adriatic Sea. This one loop bike course across the whole island leaves no place for indifferences. This impressive island with name Long Island is perfectly designed for bike course and circuit will be closed for public traffic. Bike course finishes near Telašćica – one of the safest, most beautiful and biggest natural bays on the Adriatic. Nature Park Telašćica is in immediate contact with two other protected areas, National Park Kornati and the significant landscape of the Sit-Žuz Island Group. Telašćica acquired the status of a protected area in 1980 because of its valuable flora and fauna, geological and geomorphological phenomena, versatile sea bottom life, and interesting archaeological heritage. 21 km long run course through this National Park is made of breathtaking views. From here you will see a stunning panorama – steep cliffs that fall vertically into the sea from a height of 200 meters called Stine. You will also enjoy some spectacular views of all the islands, sea, and mountains far north. Triathlon Long Island finishes in Sali, the municipal and administrative centre of island and the settlement with the largest population, located on the northeastern coast of the island. Sali is typical dalmatian village with thousand years of fishing tradition and ancient olive groves that surround the village. ‘’Dugi otok (˝long island˝) is, as its name suggests, the longest island of the Zadar archipelago and offers everything that is needed for organizing a unique triathlon experience: a long road and the beautiful sea. Swimming at the sandy beach of Sakarun, cycling along the length of the breathtaking island of Dugi otok (from Sakarun to Telašćica Nature Park) and continuing with running through the park takes the power of the entire experience to a whole new level, while also stimulating our motivation to be even faster and better. Join us on this beautiful triathlon adventure and see why you'll never forget Dugi otok,’’said Ivan Perić, one of the race organizers and member of the Triathlon Club Zadar. Dugi otok abounds with numerous bays that are ideal for triathlon - an increasingly popular way of spending your holidays or getting to know a new destination. Telašćica Bay is one of the safest natural harbours on the Adriatic, and therefore one of the potentially most scenic triathlon destinations. The bay itself is protected from winds and waves and, since it is a part of Telašćica Nature Park, boat speed is also limited, which contributes to the safety of the entire area. “We appreciate team from Triathlon Club Zadar recognizing the opportunity this premier triathlon event brings for Dugi Otok in our island’s sports tourism development. All our guests come to tell us not to change anything, to preserve natural beauty and mystery. That's why our slogan is Dugi otok - undiscovered island. The island is characterized by a dramatic landscape of great contrast, with steep slopes, thick pine forests, numerous sandy beaches, hidden bays, and coves. It is a perfect place for those in search of tranquility and relaxing holidays, swimming in the stunningly turquoise sea, enjoying sea and sun. We do hope all the participants will enjoy our magnificent island as we are delighted to welcome them.” added Ivana Čarić, director of the Tourist Board of Dugi Otok. Dugi Otok is the perfect destination for those who want to combine racing triathlon and relaxation; ‘switch off’ from the world and take a break from routine. It’s still an undiscovered Croatian island of adventure and peace at the same time, providing a unique low-cost late season island race destination in the European triathlon calendar, in island which is jewel work of nature for outdoor activities. The fair of island crafted products and festivities are common and essential parts of this small community which you’ll be able to experience at the finish. If you didn’t know, festivities in Dugi Otok are well-known for its “kick” in good food, great donkey race, and live music till the morning.” said Vice Buljat, member of the race organization. Registration are already opened. All athletes from Croatia, Montenegro, Serbia, Bosnia and Herzegovina and Macedonia have a 40% discount on the price. For a code name, go to the website contact. For all participants who will book their accommodation in with partner of the event are entitled to discount on 20% for accommodation. Ryanair flies to Zadar from London Stansted and Manchester. Alternatively, easyJet flies to Zagreb from London Gatwick, and Croatia Airlines to Zagreb from London Heathrow. There are also daily flights from Zagreb and Pula to Zadar International Airport with Croatian Airlines. Zadar is also a key transport hub with ferry connections to the surrounding islands. From Zadar, Dugi Otok is served by regular Croatian Jadrolinija ferries to Brbinj,12km south of Božava. A high-speed passenger shipping line and a ferry line connect Dugi Otok island (Sali village) with Zadar (peninsula) daily through four round trips; journey time is 1 hour 20 mins; cars permitted. Brbinj village has a connection with Zadar through a ferry boat line. The departure point of the line is the ferry port Gaženica in Zadar. Also, Božava village has a connection to Zadar (peninsula) through a high-speed passenger shipping line with one trip a day.